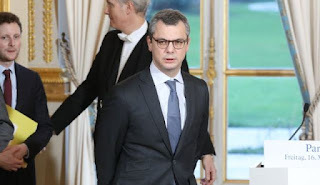 After the complaint filed against Alexis Kohler by the anticorruption association Anticor, the French National Public Prosecutor's Office (PNF) opened on Monday a preliminary investigation against the secretary general of the Elysee, close among the relatives of Emmanuel Macron. The PNF relied on a Mediapart survey published in early May to make its decision, which the Elysee responded by rejecting "totally unfounded suspicions". At the heart of these, the close links between Alexis Kohler and the shipowner MSC, a private Italian-Swiss group and one of the world's giants of the sector, with which the State conducted negotiations while the senior official worked at the Ministry of Economy. "His superiors, who were aware of his personal connections, naturally took care of the potential conflict of interest. It is therefore very likely that Mr Kohler will spontaneously communicate to the prosecutor's office all the documents proving his law-abiding conduct in all the circumstances of his career and thus put an end to the completely unfounded suspicion that was cast on him, obviously because of his duties as Secretary General of the Elysee," assures the presidency. "This complaint is based on media articles from Mediapart that contain many serious factual errors," says the Elysee. Kohler, a senior official trained in the elite National School of Administration and with extensive experience in the Administration, is linked to MSC, the world's number two container transporter, through his mother. Kohler's mother is cousin of Rafaela Aponte, co-founder of the company. The possible conflict of interests would have started at the beginning of the decade, when Kohler worked in the transport department of the State Participation Agency, attached to the Ministry of Economy. By virtue of this position, he sat on the Board of Directors of the STX shipyards of Saint-Nazaire, which had MSC as its main client. The French state currently owns 33% of shipyard shares. The conflict of interests, according to the accusation, would have continued when Kohler worked in the cabinets of the Minister of Economy and Finance, Pierre Moscovici, and later of the Economy Minister, Emmanuel Macron. In 2016, Kohler left the Ministry of Economy to work as financial director of MSC, during which he began to collaborate with Macron's campaign for the presidency of France. "At each stage, the elements revealed by the press allow us to think that he took advantage of these charges to defend the interests of his family company, Mediterranean Shipping Company," the anti-corruption organization Anticor said in a statement. In his defense, explains the newspaper Le Monde, the Elysee says that Kohler always informed his superiors of family ties with MSC, and refrained from dealing with issues related to this company during its stage in all its stages in the ministry and in the Elysee. According to article 432-12 of the French Criminal Code, any “depositary of public authority, as responsible for public service missions” runs the risk of being outside the Law, “if it takes, receives or keeps interests of any kind in companies private, whose operations must be subject to the surveillance of public administrations”. It could be the case of Kohler. Kohler, 45 years old, is a fundamental piece in the gearing of the French State. He is for the position that occupies - Secretary General of the Presidency of the Republic - a position in the shadow but influential, almost prime minister bis. In the case of Macron, a president who has centralized power in a very small group of people, this role acquires even more relevance. Kohler's task is to design the president's policies and coordinate their execution. He is ultimately responsible for running the machinery of the French State every day. Its relevance contrasts with the reluctance to focus. "I'm not a big fan of discussions about the kitchens [of power], the most important thing is the food that is served on the plates," he said in March during a meeting with journalists in his office. "We are not here to congratulate ourselves or to look at our navel about the way we act". The accusations of Anticor must be studied and instructed by the justice, before beginning or not a process of unpredictable sentence. In the judicial field, there are only well-founded or unfounded suspicions, as yet to be seen, of possible crimes of influence peddling. In the political sphere, on the contrary, the mere suspicion of such eventual crimes opens a flammable breach in the heart of the State. Suspicions that could sully the image of the secretary general of the Elysee do not directly affect President Emmanuel Macron. But, if the instruction continues its course, the situation runs the risk of rotting slowly. From the outset, President Macron's unofficial spokesmen react with a pregnant silence, waiting for events. For now, no one is evoking the eventual resignation of the most influential official in France.